The planned wedding of James Packer and Mariah Carey was torpedoed when Packer’s close friend — the Australian media billionaire Kerry Stokes — arranged to have the boat that was staging the opulent ceremony in Tahiti moved out of the area. Stokes also once grounded a private jet that Carey had demanded take her to Israel so she could be with Packer, arranging for the plane to be sent for a service, which put it out of action for six weeks. The revelations come from a new authorized biography of Packer, The Price of Fortune, The Untold Story of Being James Packer, by journalist Damon Kitney, which details the lengths the fragile casino mogul’s friends went to protect him from Carey’s allegedly diva-ish demands. 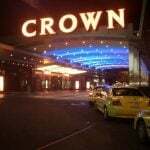 Packer resigned from the Crown Resorts board last March, for “mental health reasons,” and is currently in LA recuperating from depression and anxiety. 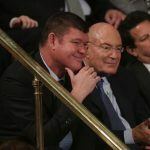 According to Kitney, with whom Packer cooperated extensively for the book, the casino mogul was spirited away to Israel by friends just weeks before the wedding to get treatment. “[Mariah’s people] were threatening to go to the police for me kidnapping James — there were some strong words,’ said Stokes, who owns Australia’s Seven television network. 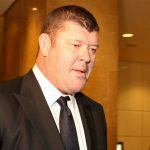 Packer admitted to “feeling manic and paranoid” after Crown Resorts received a $362 million tax bill in Australia, related to an aborted attempt to enter the Las Vegas casino market. He was also in the midst of an acrimonious settlement with his sister over the family fortune. Meanwhile, the wedding loomed, and Carey was demanding a $250,000 wedding dress, a request vetoed by Stokes. Carey also wanted the reclusive Packer to become a fixture in her Mariah’s World reality TV show — possibly the last thing he needed at the time. Packer said he left Israel still wanting to marry Carey but the relationship “fell apart” soon afterwards. Carey had already sent out invitations when Stokes intervened by having the boat moved and she had to undergo the humiliation of contacting guests to say the wedding had been canceled. “She blamed me for that and threatened to sue me for damages,” recalls Stokes. Despite this, Stokes said he liked Carey and was simply prioritizing his friend’s mental health. He described her as “charming” although someone who lived up to her “diva” reputation. “I’ve had some sample of wealth and I know a lot of wealthy people, but the wealth … which Mariah thought she was entitled [to] was beyond anything I could have comprehended,” he said.